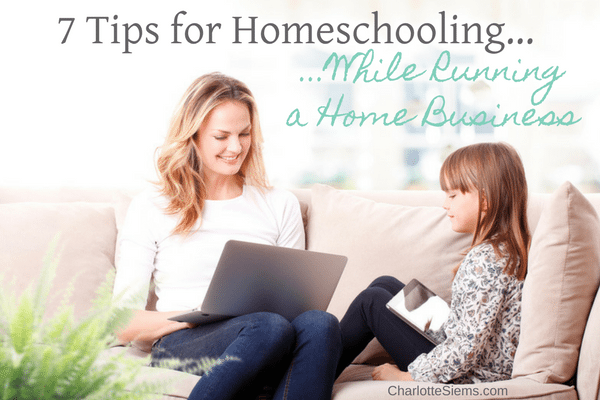 Homeschooling while running a home business will look different for everyone, depending on the type of business, goals, homeschool style, and family situation. It’s possible to run a thriving business AND a thriving homeschooling family, but it takes planning, hard work, and vision. 1) CONNECT WITH YOUR HUSBAND. He may not quite “get” your business. In fact, there may be a season of adjustment if he’s been the sole breadwinner for a long time. Keep talking and keep processing together. Make the effort to connect often in the bedroom. That will go a long way towards preventing your husband from feeling neglected and resentful of your busy-ness with homeschooling the kids and running a business. And it’s fun for you—if you let it be. Piles of laundry and too many drive-thru meals create stress for the family. Spend some time thinking through the rough spots and make a plan to deal with them. Get the kids involved, but keep it simple. Anything you do repeatedly should have a system. For instance, every bathroom should have cleaning supplies and a method to clean. Having systems (and checklists) is easier on your already-full mind. 3) FIGURE OUT A SCHEDULE FOR YOUR FAMILY. Maybe I should use the word “routine” because we don’t necessarily stick to strict time frames. For me, this “schedule” is early-morning business work and writing, morning homeschooling till lunch, then more business, with an eye on the kids’ independent work. This routine wouldn’t work for someone with a baby, two preschoolers and a second-grader, nor would they be able to spend as much time on a business. I’m in a different season of life and my schedule reflects that. Be realistic about your circumstances and don’t create a schedule that frustrates you because it doesn’t match reality. 4) WHEREVER YOU ARE, BE THERE. Resist the temptation to check email on your phone while you listen to your first grader read aloud. Put the phone in another room, if need be. Your child will love your full attention, and this type of constant multi-tasking isn’t good for your brain. Stay present. Your life is good. Don’t drift into a world of anxious thoughts and stress over business. You’ve created that world in your mind and it’s fake. Don’t miss these precious moments, average as they may seem. 5) TAKE CARE HOW YOU THINK. Beware of resenting your family because they’re an interruption to your business. Take notice if you’re creating negative associations with business tasks, such as thinking that writing a blog article is “hard.” Be careful not to view homeschooling as a jail sentence. Your thoughts can make or break your business, health, and happiness. 6) MAKE SURE YOU SPEND YOUR BUSINESS TIME WORKING ON INCOME-PRODUCING TASKS, NOT BUSYWORK. It’s easy to block ourselves by working on our website or commenting on Facebook. We think we’re “busy” but we’re really afraid of rejection or vulnerability or success. Work on yourself with a coach or your upline, plug in to training and break through your mental blocks to move forward. 7) KEEP YOUR EYES ON WHAT YOU WANT YOUR LIFE TO LOOK LIKE SO YOU’LL END UP THERE. I bet your dreams of a six-figure business don’t include a failed marriage and disconnected kids. Those things don’t happen overnight, they happen one small choice at a time. Keep your fingers on the pulse of your marriage and family, and make adjustments accordingly. Homeschooling while running a home business can be challenging, but it can also be exhilarating and rewarding. It won’t be perfect, but that’s okay. We always think someone else has it all figured out, but the reality is that every family has to find their own best way! Stay aware, keep adjusting, and keep moving forward. Don’t miss today by getting caught up in anxiety over whether you’re doing everything right. Be glad for the awesome privilege of teaching—and working—at home! with 30 years' homeschool experience. Sometimes the simplest things make the biggest difference!